JACKSON COUNTY, Tenn. (AMANDA GREER) -- It’s been almost a month since two people drowned and forty more were stranded by flash flooding at Cummins Falls State Park. The tragedy isn’t likely to hurt attendance at the park given the spot’s long history as a favorite Tennessee swimin’ hole. 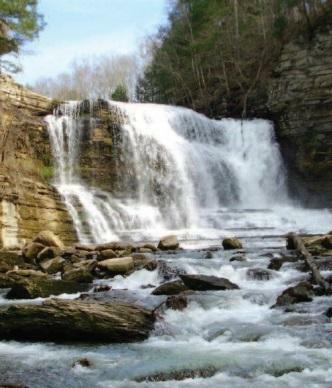 Cummins Falls is located northwest of Cookeville in Jackson County. It’s been a popular summer destination for years, well before it became a state park in 2012. Park manager Ray Cutcher says that in 2016 alone, Cummins Falls had over 300,000 visitors. That’s up fifty thousand from the year before. To compensate for the increased visitation, the park is looking to add a visitors' center and additional restrooms. The state is also working on the park’s accessibility. Following the flash flood tragedy, park officials are also working to upgrade safety measures. Meetings are ongoing with National Weather Service and other agencies to develop a warning system at the park.